It’s also to be borne in mind that these 110,000 homes and businesses were plunged into darkness at a time when SA’s Northern and Playford coal-fired plants at Port Augusta (with a combined capacity of 784 MW) were still happily chugging away. The owner of Port Augusta’s plants, Alinta has already signalled that it will close them in April 2016, due to the market distortions caused by the massive subsidies to wind power set up under the Large-Scale RET. If it does, South Australians can expect statewide blackouts with the kind of regularity that you’d be hard pressed to find outside of sub-Saharan Africa. Already an economic basket case, South Australian businesses are unlikely to tolerate this type of chaos for much longer. Subsequently, the hapless Weatherill Labor state government refused a deal offered by Alinta to keep the plants open. Not concerned to be charged and convicted of schadenfreude, STT was happy to sit back and say “we told you so”, while clowns like SA’s vapid Premier, Jay Weatherill and his witless Energy Minister, Tom Koutsantonis tried desperately to spin their way out of trouble. Since the 28 September blackout, the Premier and his entourage of wind worshippers have kept focusing on the rearview mirror, when they should have been looking dead ahead: Weatherill & Co should stop trying to exonerate their beloved wind farms over the September catastrophe and start worrying about the next wind power output collapse and resulting blackout. Simply because, as Yogi Berra keenly observed, déjà vu has a habit of happening all over again. BHP Billiton chief executive Andrew Mackenzie is furious another failure of the electricity network in South Australia resulted in the Olympic Dam mine being without power for more than four hours overnight. He said the outage – which affected 200,000 customers early on Thursday – was a wake-up call to politicians across Australia and that energy security must be urgently addressed or investment and jobs in Australia would be jeopardised. “Olympic Dam’s latest outage shows Australia’s investability and jobs are placed in peril by the failure of policy to both reduce emissions and secure affordable, dispatchable and uninterrupted power,” he said on Thursday. Federal Energy Minister Josh Frydenburg said the outage was a reminder of the vulnerability of wind-heavy SA’s energy supply and the need for states to be able to produce their own power to reinforce energy security across the national electricity market. South Australia depends for about 45 per cent of its generation on wind and solar energy but the wind was barely blowing at about 1.15am Thursday when the state was cut off from Victoria’s brown coal power and the local supply from the Torrens Island and Pelican Point gas plants was not enough to meet demand. 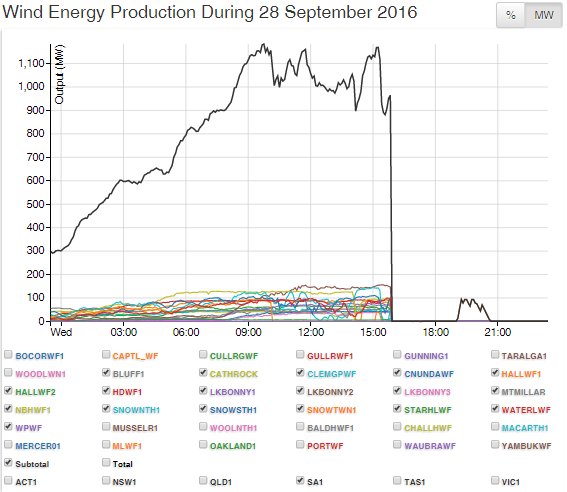 Just before that, the state was generating about 880 MW from gas plants, 125 MW from wind and importing about 460 MW from Victoria, AEMO said. Olympic Dam, which produces copper and uranium, was unable to operate for more than two weeks after a state-wide power blackout in late September following a severe storm-induced collapse of the electricity network which plunged the entire state into darkness. The mine, 560 kilometres north of Adelaide, only came back on line on October 13 because the transmission line it was on took the longest time to be repaired. The shorter blackout overnight in South Australia was the result of the Heywood interconnector – South Australia’s energy lifeline to Victoria – tripping after a transmission failure in Victoria. The state has suffered from high wholesale electricity prices with frequent spikes, supply squeezes and stability and frequency control problems whenever Heywood has been operating at reduced capacity since last year, and especially since the closure of its last coal fired power station – Northern in Port Augusta – in May. 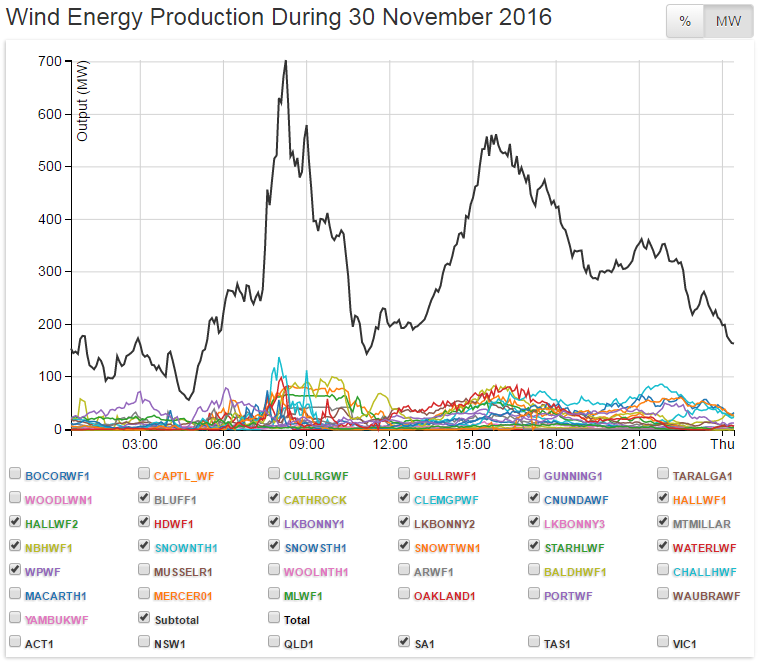 On Thursday prices peaked at $13,533MWh between 1.30am and 2am National Electricity Market time (2.30-3am eastern time) and again at $9,175MWh between 10am and 10.30am. South Australian electricity futures for 2017 and 2018 are about $106MWh compared with $67-69MWh in coal-rich Victoria and NSW. Mr Mackenzie said the broader policy situation needed to be fixed urgently. “The challenge to reduce emissions and grow the economy cannot fall to renewables alone,” Mr Mackenzie said. OZ Minerals, which runs the Prominent Hill copper mine about 850 kilometres north of Adelaide and is preparing to invest $980 million on the new Carrapateena mine in northern South Australia which is due to begin production in 2019, was also hit. Prominent Hill was without power for up to six hours. A spokesman for OZ said on Thursday “there needs to be a co-ordinated federal and state solution”. The Whyalla steelworks, which is one of the assets in the final stages of the Arrium sales process by administrator KordaMentha, was almost affected by load-shedding but a spokesman said there was no material impact because of self-generation and internal load-shedding. The Australian Energy Market Operator said that at 1.33am AEDT on Thursday the South Australian power system “separated from Victoria” resulting in localised outages in the state for up to an hour, together with the disconnection of the Portland smelter in Victoria. AEMO said the separation of the SA part of the network was due to an issue on the Victorian transmission network, affecting the flow via the Heywood interconnector. It said the “root cause” was still under investigation. AEMO said about 220 megawatts of power was lost in South Australia “due to the need to balance the frequency of the network”. 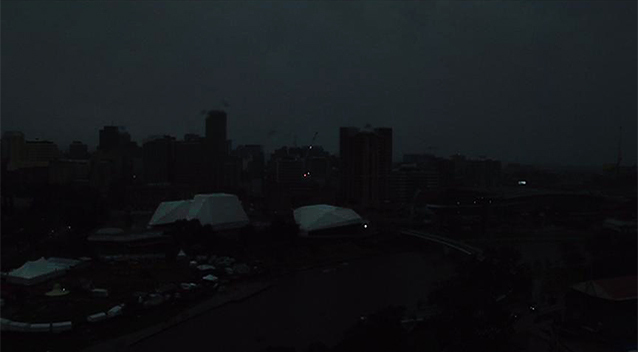 By 5.41am AEDT the South Australian power network was reconnected to the national grid. South Australian Treasurer Tom Koutsantonis, who is also the Energy Minister, told reporters on Thursday that AEMO had made a deliberate decision to shut off the state from the national grid after a problem with the interconnector had emerged. “It wasn’t our fault,” Mr Koutsantonis said. A spokesman for Alcoa Australia, operator of the energy-hungry Portland smelter, said the plant was out cut off from power for about five and a half hours from 1.15am. It was still bringing its potlines – the lines of large crucibles in which alumina is smelted into aluminium under high voltage – at midday on Thursday. The fact that, when wind power output collapses, the spot price rockets from an average of around $90 per MWh in SA all the way to the regulated market cap of $14,000 per MWh is so well-known, these days it barely raises an eyebrow (see above). However, there are, no doubt, plenty of South Australians (including those on life-support systems) and South Australian businesses who would probably suffer those extortionate rates, if only power could be supplied around the clock. In SA, though, its weather dependent power supply has a mind of its own and, with increasing regularity, simply fails to deliver when it counts or at all. On that score, the boys from the AFR place just a little too much faith in the AEMO’s guff about 220 MW of power being “lost in South Australia due to the need to balance the frequency of the network”. When it comes to dissecting South Australia’s energy debacle, the answer, as always, can be found with a few simple clicks, thanks to the boys over at Aneroid Energy. What happened thereafter, and which will happen over and over again, is that – with the total and sudden collapse in wind power output – the resultant loss of voltage and frequency tripped the Victorian interconnectors, thereby cutting South Australia loose from the grid. Without adequate spinning reserve to maintain grid stability (which would have been available had Alinta’s Port Augusta plant been operating), 200,000 homes lost power and, to the fury of SA’s few remaining miners and mineral processors, power was cut for more than 5 hours; including BHP Billiton’s Olympic Dam copper and uranium mine and elsewhere across the State. The AFR’s editor, Jennifer Hewitt has always had a soft spot for the idea that economies can run on sunshine and breezes. However, what’s occurred in SA appears to have brought Jennifer back to earth. The Weatherill government in South Australia can only pray for an unusually cool summer. Heat waves often coincide with a lack of wind and always with people cranking up their airconditioning. That combination is going to severely test the stability of the SA energy market as it goes into its first summer without any coal-fired generation and is the state by far the most reliant on renewable energy. That’s also why the Weatherill government was so keen to point its finger in the direction of Victoria after power was cut for a few hundred thousand South Australian residents as well as Olympic Dam in the early morning hours of Thursday. Indeed it did. But that excuse avoids dealing with the real problem becoming evident in SA. The state can no longer always generate enough power for its own needs, making it dependent on supplies from Victoria. So when Victoria is having difficulties of its own meeting state demand or there is a transmission fault, SA is left, as Koutsantonis so wonderfully described it, “islanded” in a national energy market. The Australian Energy Marker Operator noted an issue with the Victorian transmission network overnight, which reduced the flow into SA via the Heywood interconnector. That’s compounded by the fact SA now has far less ability than other states to quickly adjust by turning to other reliable sources of power due to the loss of coal generation and limited gas capacity. Instead it has embraced renewable energy as the alternative that now supplies around 40 per cent of the state on average. That’s reliable and cheap power when the wind’s blowing, of course, but not otherwise. And if the wind blows excessively hard – as it did in the severe storm conditions of last October – the reliability and stability of supply in that state are further threatened. Meanwhile, Victoria is also arguing that it is moving to much greater use of renewable energy while its Hazelwood coal-fired station is shutting down next March, putting Victorian energy prices up and supplies down. As one energy expert says, this week’s SA drama – even if it does not compare to October’s blackout of the entire state – is just another warning sign that a very tight situation is getting worse. Little wonder that BHP Billiton chief executive Andrew Mackenzie is sounding so frustrated at yet another shutdown of Olympic Dam after the mine was also unable to operate for more than two weeks in October. The suggestion from Koutsantonis that BHP should just build its own power station as it has in other parts of the world is hardly going to resolve the bigger economic issue – let alone BHP Billiton’s bottom line. Mackenzie points out that Australia’s “investability and jobs are placed in jeopardy by the failure of policy to both reduce emissions and secure affordable, dispatchable and uninterrupted power”. He is describing it as a wake-up call ahead of another meeting between the states and the Commonwealth on Friday, arguing that power supply and security must be top of the agenda. “The challenge to reduce emissions and grow the economy cannot fall to renewables alone,” he said. Yet there’s still no agreement on how to manage an energy market “in transition” and what will replace it. That’s exacerbated by the willingness of state Labor governments to announce their own ambitious renewable energy targets with little emphasis on how to deal with the practical issues that will inevitably result. At the same time, gas generation is often only marginally profitable because it is squeezed between cheaper coal or renewable energy except at certain times. The Pelican Point gas station in SA had mothballed half its capacity, for example, and was close to closing before the Weatherill government pleaded with it to re-open in the wake of a huge if temporary spike in prices in July. To the extent that there’s a cushion it’s only because of decreasing or flat demand from industrial users and increasing energy efficiency of household appliances. Victoria’s power crunch post Hazelwood, for example, may be delayed if the Portland aluminium smelter closes down, in part due to the rising price of power. Just imagine the amount of crocodile tears flowing from the Andrews government over those jobs being lost. 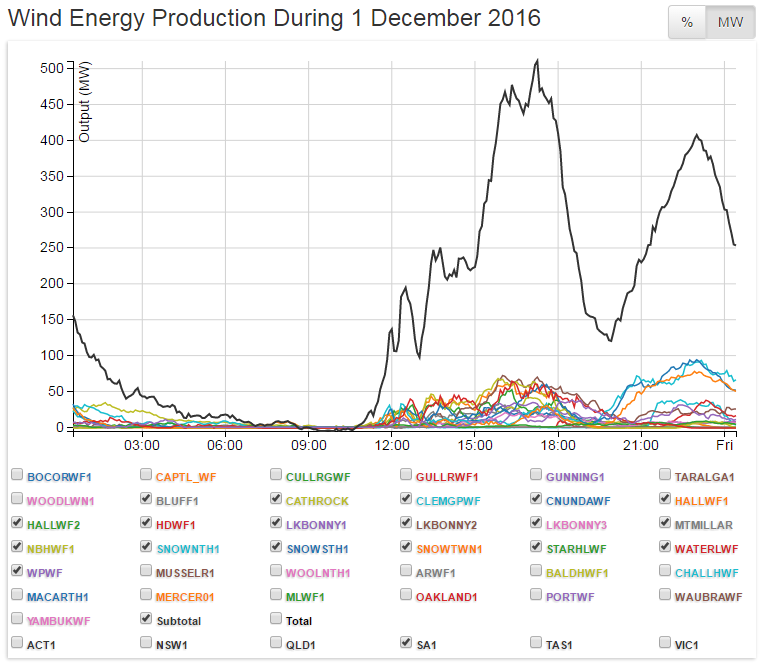 South Australia is insisting the answer for its problems is more gas generation – but who’s paying the bill? There are always glitches in any system. The catch now is there is so little room for error when there are problems in one part of the network or market. Instead, the impact can quickly cascade. In a report on Thursday, Matthew Warren from the Energy Council of Australia noted it was possible to plot firm generation and internet capacity against predicted maximum demand conditions. According to this graph, that minimum reserve margin in SA is likely to be at its lowest this summer. That is due to the closure of the Northern coal-fired power station earlier this year and the fact that the interconnector with Victoria is only gradually coming back to full capacity. The following summer, reserves will be affected by the closure of Hazelwood. While it’s still theoretically possible for Victoria to meet its own maximum demand and to supply SA, this relies on everything going right all the time. That includes an ever extended network of generators and transmission lines working optimally under all conditions rather than suffering faults and outages. Guess what the chances are? Weatherill won’t be the only politician spending time looking at weather reports as a predictor of political longevity. Over the next few posts, STT is going to merrily run a string of articles that appeared in the mainstream media in the aftermath of yet another blackout caused by a total and totally unpredictable wind power output collapse. 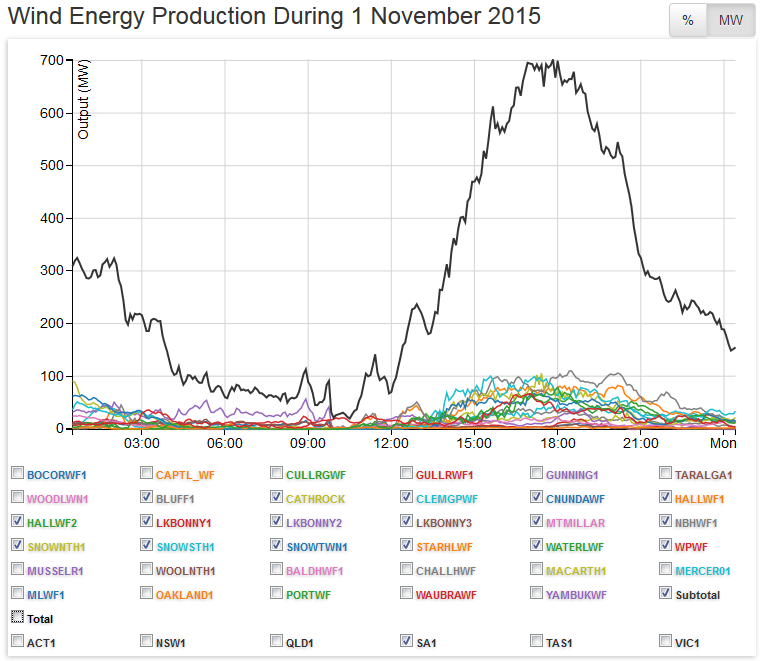 The energy disaster that is South Australia is something that Weatherill and Koutsantonis can proudly call their own. Welcome to your wind powered future, Tom! Tom Koutsantonis: his ignorance brings little bliss for SA. I have Multiple Sclerosis & petrified of blackouts , condition worsens dramatically with NO AIR CONDITIONER. Pleas hurry & get a Government that gives HOPE & UNDERSTANDING. A point that has totally been missed by everyone with this blackout is the fact that in the past, South Australia could have prevented the damage to the Alcoa smelter (and made a tidy profit) by supplying Portland with exports via the Heywood Interconnector, even if only at a maintenance level to keep the pot lines warm on a rotation basis. Instead, the South Australian grid was unable to self supply, let alone provide external support services. The South Australian attitude has been so self-concerned that their ability (or rather lack thereof) to provide support to interstate users has been totally ignored. Just another utter failing for the renewables transition. Federal Energy Regulatory Commission is US requires a full grid [no outages], Public Service Company of New Mexico director told us. Penalties exacted from power company for compliance failures, we were also told. Wind power output guarantees? It is well known in South Australia that young Tommy Kouts is to energy policy what Lorraine Bobbitt was to General surgery. The short point is that wind turbines do produce power, but do not produce reactive power (ie they cannot speed up or slow down in response to variation in load), thus there must be sufficient reserve capacity (ie spinning reserve or fast start peaking plant) to follow the fluctuations in load and the fluctuations in wind power voltage and frequency. Correct. The very moment you load the wind turbine it will drop in voltage and frequency. Where a gas or coal power plant increases its fuel flow to react to the higher load, the wind turbine can’t increase the windspeed. It just follows that. All that can be said is WE TOLD YOU SO and we did tell you zombie SA government, that this would happen and it has on a number of occasions. The SA GOVERNMENT is so bloody pig headed, and that goes for the rest of the Labor party and the Green Grub party as well. Back in July, I wrote a 5 page letter to Josh Frydenberg detailing the summer situation that Jennifer Hewitt describes. The only response was a form letter from his office. Good luck South Australians – and buy a generator and lots of jerry cans of fuel. Understanding the ‘Green Blob’. Lesson 101. Until the average Aussie electricity using punter wises-up to the fact that for years they’ve been conned by PC government legislation, the federal government Renewable Energy Target act, which funds via charges tacked onto our electricity bills the obnoxious rent seeking, wind industry troughers, who are currently bleeding our country dry to the tune of $3 billion per year, increasing. And all of course for no measurable outcome, unless of course you are one who believes that the world’s temperature can somehow be controlled by politicians in a room in Canberra with a CO2 thermostat? This whole problem has been created by the stupidity of people from those in the UN who pushed for the world to go ‘Renewable’, by those National Governments who kowtowed to this demand before ensuring they were capable of achieving with the required percentage reduction in energy production emissions. With Australia as with so many other nations the complete lack of judgement of those politicians as well as those campaigners who constantly lied to get Governments to accept a totally ludicrous form of energy production, a form could never service the demands of modern industry and today’s social energy requirements, to those who wriggled with hands out to industry pressure sales teams to ensure they secured offered bribes to allow erection of these less than noble towers of destruction on their land. We now have two maybe 3 States heading into the depths of despair and depression because all of the above did not first consider the consequences of their actions – even now as we see with Weatherill and Koutsantonis they are only willing to put their head in the sand even deeper and blow out the other end – its not our fault its theirs over their and there is a resonating response from them over their – no its not its them over there’s fault. Why can’t they stop this stupidity and why doesn’t the Federal Government take charge – surely the supply of secure electrical supply is a National necessity and if it is then maybe its time the Feds took it on and sorted the whole mess out with the first step being to stop handing out REC’s to Wind Energy and ensure money is available to re-fit coal power plants with the latest machinery to ensure reduction in emissions, and force the cancellation of Gas contracts and re-negotiate deals where they only get what we do not need ourselves. The pressure cooker of the wind industry has lost its puff and needs to be stopped and prevented from relighting and blowing anymore steam. We have all been burnt by their actions.